Books are powerful. I can travel anywhere in a book, and I can take a book with me wherever I go. Reading is still the best source of information. It teaches me new skills and how to have a new, positive outlook on life. I try to read a book every week. Sometimes I download books from the Internet, websites, and e-books, which can have a wealth of information. Sometimes I borrow books from friends, and in Afghanistan we have several libraries, although finding books translated to our own languages can be difficult. 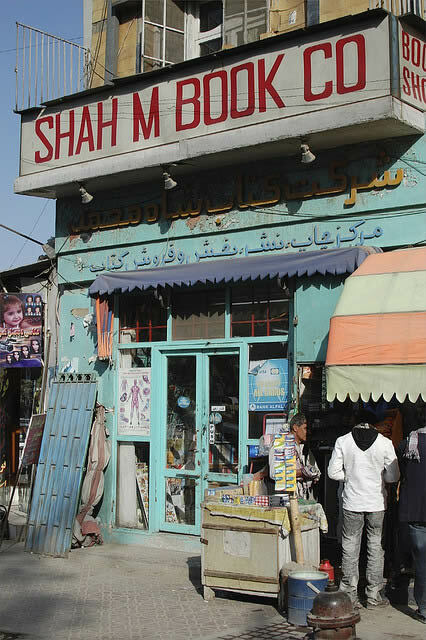 Readers in Afghanistan generally prefer to buy books from a bookstore. We have several bookstores, but my favorite one in Herat is Abdali Bookstore. It was named after Ahmad Shah Abdali, the founder of modern Afghanistan. Afghans refer to him as Ahmad Shah Baba (Ahmad Shah, the father). Abdali was also a brilliant Pashto poet. Abdali Bookstore has shops in all of Afghanistan right now. When you are walking on the street you can easily find the store and you will find different books organized by topic on the shelves. Although there are no places for readers to sit and spend time in the bookstore, the owner spends time with the customers to help them find the book they want. But sometimes they might only have one copy. One day I was searching for a book by modern Iranian scholars at the bookstore near the Blue Mosque of Herat. I saw the young salesman in his bookstore immersed in a book in his hand and I asked him what he was reading. Among all of the hundreds of books for sale he was holding the very book that I was looking for! I asked: “How much does the book which is in your hand cost?” He said: “This is the only version I have and it’s not for sale because I’m reading it!” I love the Herat tradition of books and reading. We have many popular books and Afghan authors. Afghanistan in the Path of History is very popular. One popular author now is Mohammad Azam Rahnaward Zaryab. He is an Afghan novelist, short story writer, journalist, literary critic, and a scholar. Most of his books are published in Iran. Another popular author is Razaq Mamoon, a political analyst and journalist in Kabul. He is originally from Panjshir province. He has published more than two thousand political and nonpolitical articles and he is one of the most famous authors in Afghanistan. Sadly, fewer people are now reading books. One reason is poverty. Most of the people who buy books are students getting books for school. Reading is increasing in Afghanistan among students but many people still don’t know about the value of reading. I think a person can enter into to a new life by reading only ten minutes in a day. There are many books I adore and each has changed me in an unforgettable way. One of my favorite books is Robinson Crusoe, the fiction book about a man lost on an island. Others are The Power of Charm: How to Win Anyone Over in Any Situation, and Eat That Frog! 21 Great Ways to Stop Procrastinating and Get More Done in Less Time, both by Brian Tracy. I love Brian Tracy’s books. These books have influenced me because they introduced me to great information and helped me improve my social life and self-confidence. They taught me how to be a good listener and opened my mind to a whole new way of thinking and looking at the world. I learned from them to appreciate all I have, and they taught me to always count my blessings. I love this essay! What wonderful writing!! Thanks for sharing this essay on reading and bookstores in Afghanistan. I found it very interesting. Have you read any books by Khaled Hosseini, the Afghan American author? I used to teach his first book, The Kite Runner, to high school students. His book kindled my interest in Afghanistan’s history and culture. I also enjoy Iranian literature. My favorite Iranian authors are Azar Nafisi–a professor of American literature who lives in the U.S.–and Marjane Satrapi, who lives in France. I also read some work by Sharnush Parsipur which I found challenging but worth the effort. It’s a shame so few people read in Afghanistan; things are similar in the US but for different reasons–people spend a lot of time on social media and playing video games or watching television instead of reading. Thank you dear Kathy and Gillian for your kind comments. Dear Gillian, yes I have read books by Khaled Hosseini he is my favorite author. People everywhere know that books are great resources for learning, but in your article, the importance and influence of literature is portrayed phenomenally. You have described in detail the impact that reading has had on the people of Afghanistan. I love the description of your favorite bookstores such as the Abdali Bookstore in Herat. You mention that books are a way to travel and escape to new places in order to learn new things about the world. I believe reading is one of the most important tools in education. Having the ability to read about another person’s experiences, or simply another point of view has immense impacts on one’s life. Books allow people to broaden their views of the world. In Afghanistan specifically, despite the hardships you may face, books are a way to see beyond the violence and provide comfort and knowledge. I loved reading your essay about how Brian Tracy’s books have helped change your social life and self-confidence. Being able to express your opinions and share them with the world is another key skill that can be acquired from reading books. I encourage you to always keep reading and spread your love of literature to the world.